Whether it’s on a major highway or a road with very little traffic, road workers should always have on hi-visibility uniforms. Construction work has a lot of hazards, and a lot of these hazards come from motorists passing by. Road workers even face danger from within their own project, so it’s important that every employee easily stands out with road work uniforms. The National Institute for Occupation Safety and Health identified proximity to construction vehicles and motor vehicle traffic as an exposure source to being struck or backed over. Between 2003 to 2007, data from the U.S. Bureau of Labor Statistics showed that 10 percent of fatalities resulted from workers being struck from a dump truck that was backing up. Hi-visibility uniforms won’t be able to stop every tragedy, but it is a great way to increase safety of road workers and individuals operating equipment within the project. The data from injuries and fatalities occurring because of vehicles backing up simply indicates that a worker can easily blend in to the surroundings. 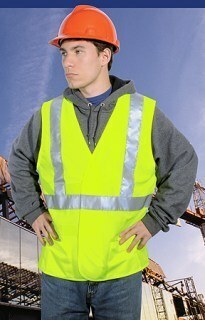 Uniforms that are specifically designed for high visibility help a road worker stand out and not blend too much into the background. One of the greatest threats to road workers now is accidents caused by cell phones. The National Safety Council estimates that 23 percent of passenger vehicle crashes are attributed to cell phone talking and drivers texting. While there are laws prohibiting cell phone use while drive, there are always going to be people who avoid the rules. When a construction area is filled with workers with hi-visibility uniforms, hopefully that can help quickly get the attention of a distracted driver. Road work uniforms aren’t fool proof, but they do add another layer of security to help protect your employees from distracted drivers.